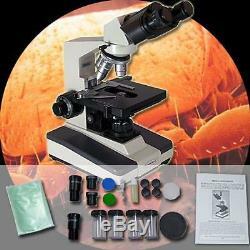 Our binocular microscope MRP-3000 (stereo microsciope) is a professional equipment with a brilliant resolution. With its extensive equipment, the generously conceived cross table, optically very high-quality achromatic objectives and the effective, precise adjustable lighting unit of the MRP-3000 offers best technical premises for the professional employment in laboratory, university, school and industry. The replaceable, 360° rotatable 10x and 20x wide field eyepieces are disposed 45°. So they enable an ergonomic and relaxed working. At the tubus you also will find a dioptre adjustment wheel. The microscope is equipped with four objectives (4x/10x/40x/100x) for the magnification stages 40x, 80x, 100x, 200x, 400x, 800x, 1000x and 2000x. The microscopes covers the entire spectrum you need. The re-developed transmitted light illumination posseses a condensor lens with a light- collector for individually adjustable and better lighting. Nothing leaves to be desired. You can handle the light with a separate rocker switch. The equipment is directly connectable to the normal current supply without any annoying power pack/adapter. An high ease of use is promised by the cross table movable in four directions by vertically lying coaxial control knobs. Also a comfortable focusing is provided by its fine and coarse adjustment. In combination with our microscope cameras you can transfer the appropriate pictures digitally to a notebook, pc, beamer or any screen. Your audience may pursue your observations comfortably at any screen in real time. Technical specification: - Magnification 40-2000x - Binocular - Tubus with 45° angle, 360° rotatable, Dioptre adjustment - Eye distance symmetrically adjustable from 55 to 75 mm - Height adjustable Abbe condensor N. 1,25 mit iris, light-collector and filter holder - 4 objectives (4x/10x/40x/100x) at the ball bearing revolver - Coaxial control knob (on both sides) for fine and coarse adjustment and arrest arm - Adjusment wheel for Einstellungsrad for stress intensity - Coarse adjustment: 30 mm; Fine adjustment: 0,002 mm - 140 x 140 mm cross table (moveable area 75mm x 45mm) - Halide lamp 12 volt 20 watt with illumination control (230 V power supply) - Dimensions: 190mm (B) x 400mm (H) x 275 mm (T) - Weight: 7,1 kg. Scope of supply: - Binocular-Microscop MRP-3000 - Ocular-set 10x and 20x - 4 Objectives (revolver) - Stand with cross table - 1x blue filter and 1x green filter - 1 dust cover - Spare halide lamp - Immersion oil - 230V power cord. 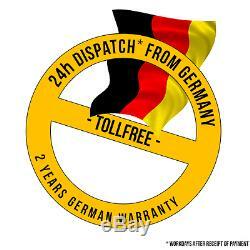 We need 2-4 days for delieveries to europe. Each delievery is attached a bill with proven VAT. The item "MICROSCOPE/MICROSCOOP STEREO BINOCULAR LABOR MK5" is in sale since Thursday, February 08, 2018. This item is in the category "Collecties & Verzamelobjecten\Wetenschap & Geneeskunde\Microscopen, laboratorium". The seller is "top-messtechnik" and is located in Erding. This item can be shipped worldwide.